I manage to drag back one can of duck Confit during my last trip toFrance. It’s not light I tell you. The can I bought has 4 duck legs in it. 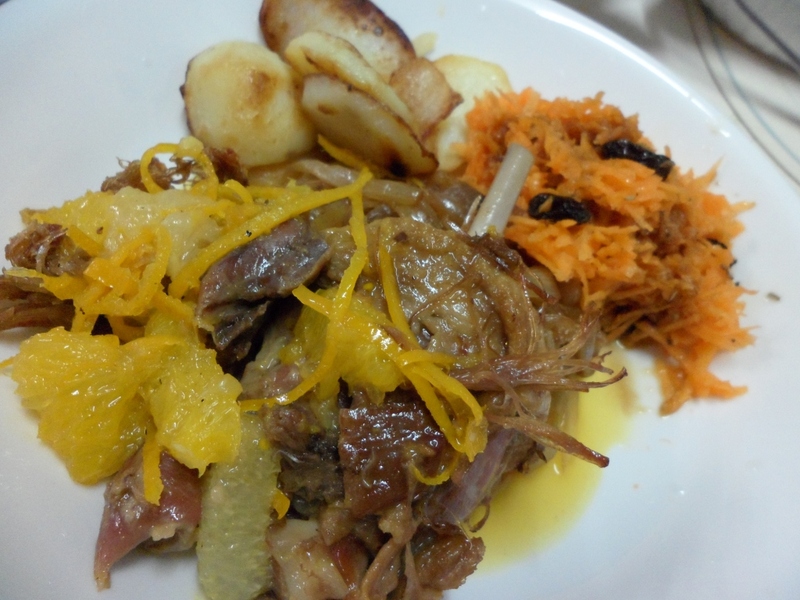 Oh yes – for those who are not familiar, Confit de canard is preserved duck (the French method). It is basically duck legs which were salted with some herbs and then later slow cook with its own fat for a long time. Then, the finish product can be kept for months. It is very similar to the Chinese wax meat, except the Chinese version is dry whereas the French versions are soaked in duck fat. So for Christmas / hubby’s birthday celebration 2011, I decided to try my hand on cooking these babies. 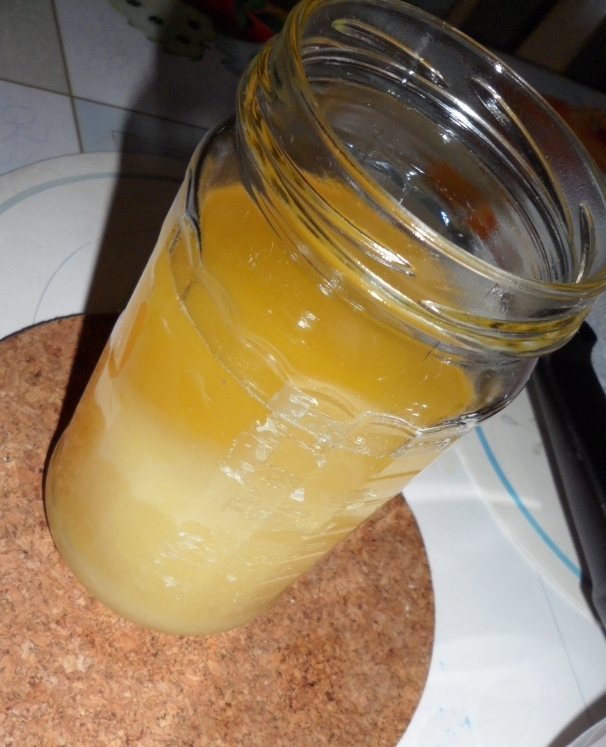 Upon opening the can, I try my best to scoop the solidified duck fat into a jar (these are liquid gold!!!). Try not to separate the legs as the legs are very tender and will fall apart easily. I used bain-marie (with very low fire) to slowly let the remaining fat melt away. It looks amazing already. After that, I heat up the sauté pan and place the skin side up. Fry it on slow heat until the skin turn crispy. Once the skin is crispy, you can lift them up. There is no need to fry on the other side as the meat is actually already cooked. 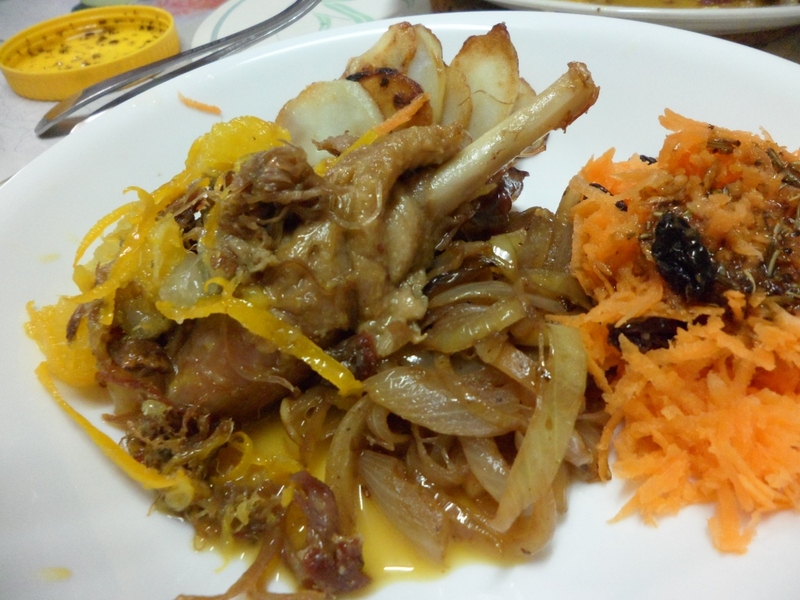 Commonly, confit de canard is served in like this with a bit of roast potatoes and salad on the side. But, I find it a bit too dry for my liking. Hence, I prepare some orange sauce to go with it. Using the same pan, I pour in all the ingredients and bring to boil. Once it is boiling, I continue to let it simmer until the sauce reduces to the consistency I like. I got a little greedy and prepared 3 side dishes. Roast Potatoes, Caramelized Onion and Carrot Salad with raisins and balsamic vinaigrette dressing. Dinner is served. 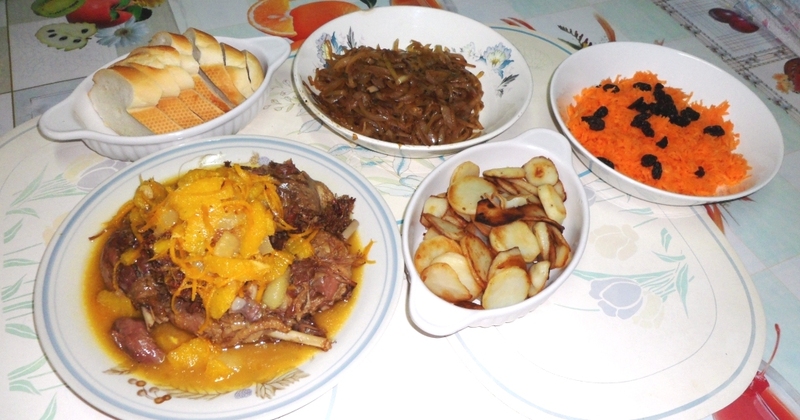 Confit de canard à l’orange. It was dinner only serving for 3, so, there was one leg left over… I wonder what should I do with it… ?! !